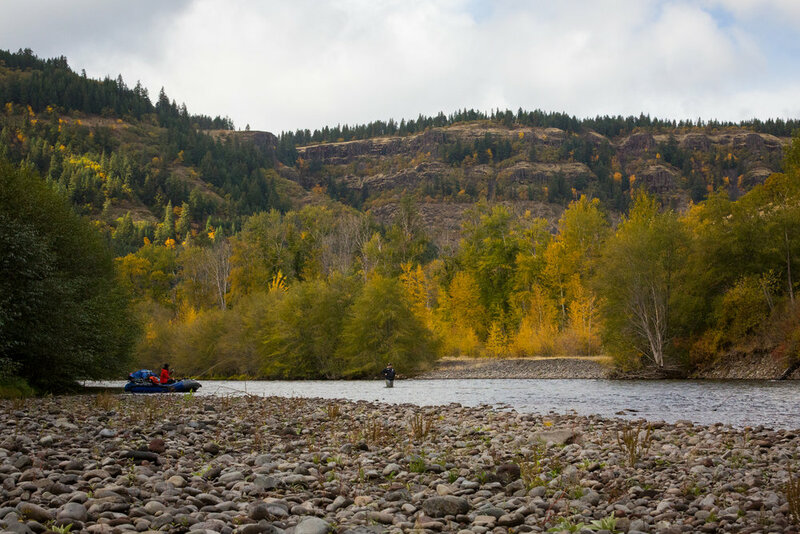 Located in South Central Washington along the east slope of the Cascade Mountains, the Klickitat hosts a strong run of steelhead during the late summer and fall months. Originating high on the glaciers of Mt. Adams and flowing over 90 miles to its confluence with the Columbia River, the Klickitat meanders its way through deep canyons, dry alpine forests, and basalt rock formations. The gradient of the Klickitat is steeper than neighboring Columbia River tributaries and it is for this reason that it seems to have created its own breed of steelhead - often bigger, stronger, and more determined. The beauty of the canyon is intense. At the peak of the fall steelhead season, the canyon foliage comes alive with rich tones of yellows, reds, and oranges. Crisp mornings yield way to mid-day sun, followed by cold and clear nights as the sun drops away behind the canyon walls. It is this time of year that the Klickitat is at its best. Like all of our trips, spey rods are our tools of choice and the Klickitat offers an abundance of water well suited for swinging flies. Multi-Day camp trips are our primary offering on the Klickitat and in our opinion, are the best way to experience everything this river has to offer. Much of the river has little or no vehicle access, creating a unique wilderness steelheading experience. Full days of swinging flies, gourmet fresh cooked meals, and evenings around a campfire beneath the stars are the hallmarks of our camp trips. Anglers are greeted each morning with hot coffee, warm breakfasts, and the option of a dawn fishing session. We take care of all logistics and equipment. Each night we will set up a deluxe river-side tent camp, complete with comfortable sleeping accommodations, toilet, and dining area. We choose our campsites based on access to premium "camp water" (ie. top notch steelhead water right where we are camping). Dawn and dusk fishing sessions are one of the greatest perks of overnight camp trips. By day, we float and fish our way down river, covering anywhere from 5-10 miles per day, before pulling into camp for the night. We offer Klickitat River Camp Trips as either a 3 day/2 night trip or a 2 day/1 night trip. For those who would prefer to stay in town and forgo the camping experience, we are happy to offer day trips with a 2 day minimum booking. Location: Klickitat, WA serves as the launching off point for all of our Klickitat River guided steelhead trips. Your guide will meet you in town where you will leave your vehicle. Rivers: The Klickitat River in south central Washington. The Klickitat River provides an abundance of quality steelhead water. The section of the river that we float will depend on the length of the trip (3 day, 2 day, or single day) as well as river conditions. Fishing Method: We use drift boats/rafts to float the river, getting out at productive runs and wade fishing. While we use the boat to provide unlimited access to the best runs on the river, all fishing is done while wading using spey rods and swung fly techniques. We are passionate about pursuing steelhead by using spey rods to swing flies. Our guides are exceptional spey casting instructors and pride themselves on making sure that you become a more proficient spey caster throughout the course of the day. New to spey? Not a problem, we love working with people who are new to spey casting or new to fly fishing entirely. Spey casting is not hard, it just takes the will to learn and a good instructor. Multi-Day Camp Trip Logistics: On our multi-day camp trips, we will float down the river for 2 or 3 days (depending on the option chosen) and set up camp each night along the river. All of our camping/fishing equipment and food is carried with us in the rafts. You will be on the river for the entirety of the multi day experience. We take care of all of the camping logistics and equipment. Each night RSO staff will set up a comfortable mobile camp, complete with tents, dining area, and toilet. All food will be prepared for you and served at meal times, including hot coffee/tea to get the day started. We provide all equipment for camping, including waterproof dry-bags for you to pack your clothing and personal items in. Day 1 8AM - Meet your guide in the town of Klickitat. Leave vehicle in town or at river take-out location. Proceed to boat launch, organize gear, transfer personal items into dry bags, launch boat and begin float trip! Day 1 Evening - Arrive at campsite around 5pm. RSO guides will be busy setting up camp. Fish "camp water" or kick back and relax...up to you! Day 1 7pm"ish" - Dinner served. Enjoy the rest of the evening around the campfire (when fires are allowed) or however you would like. Retire for the night whenever you are ready. Day 2 Bright n' Early - Wake up to enjoy a dawn fishing session. Guides will have hot coffee and snacks ready to go. Swing flies through "camp water" or sleep in...up to you! Day 2 8am"ish" - Breakfast served. Day 2 Evening - Arrive at campsite around 5pm. RSO guides will be busy setting up camp. Fish "camp water" or kick back and relax...up to you! Day 2 7pm"ish" - Dinner served. Enjoy the rest of the evening around the campfire (when fires are allowed) or however you would like. Retire for the night whenever you are ready. Day 3 Bright n' Early - Wake up to enjoy a dawn fishing session. Guides will have hot coffee and snacks ready to go. Swing flies through "camp water" or sleep in...up to you! Day 3 8am"ish" - Breakfast served. Day 3 Afternoon - Float down river, stopping in prime steelhead runs to fish. Day 3 Evening - Arrive at the take-out around 4-5pm. Your vehicle will be waiting for you either at the take-out or nearby in town. Recommended Lodging: Depending on where you are driving in from, you may want to reserve lodging the night prior to the start of your camp trip. If you are opting for single day trips rather than a camp trip, you will need to reserve your own lodging for each night of your stay. Airbnb as well as VRBO offer quality rental options in the Klickitat area. Additional lodging can be found in Goldendale, WA (30 min drive) or Hood River, OR (45 min drive). Recommended Equipment: **If this is foreign to you, read no further, we've got you covered. ** On the Klickitat we prefer spey rods in the 6-7wt 11'-13' size range. Both Skagit and Scandi heads are appropriate, with a variety of floating and sinking tips/polyleaders. Early in the season we will be more likely to use lighter tips/polyleaders, while later in the season conditions may necessitate Skagit heads and heavier sink tips. Fly selection will depend on river conditions, however medium size flies such as Ho-Boh speys are always a good call on the Klick. We are happy to provide all equipment free of charge on all trips. For camp trips, we provide all camping equipment, however some guests prefer to bring their own sleeping bags. A more detailed packing list will be provided at the time of booking. Included: Camp trips include guided fishing for 2 or 3 days, all food, non alcoholic beverages, all fishing and camping equipment, and deluxe tent camp accommodations for 1 or 2 nights. Day trips include approximately 8 hours of guided fishing, deluxe shore lunch, non-alcoholic beverages, all equipment (including spey rod/reel, waders, boots, flies, leader), and shuttle (you may be asked to assist with shuttle logistics depending on the stretch of river that we are floating). Not Included: Guide gratuities, alcoholic beverages, fishing license. Fishing Licenses: WA state fishing licenses can be purchased online here. Booking Policy: A 50% deposit is due at the time of booking. The remaining balance is due two weeks prior to your trip. Full payment is required for all bookings within one month of trip date. Cancellation Policy: Cancellations within 30 days of trip date will result in a forfeiture of deposit if a reschedule date cannot be agreed upon. Cancellations by the guide due to weather, river conditions, or other circumstances will be refunded in full or rescheduled with no penalty. Cancellations due to river conditions or weather are exclusively at the guide's discretion.